In 1912, the proprietor of Tommygun Tavern (currently being re-claimed in Holland, MI) built this cozy and charming 2 bedroom bungalow perched on top of the hill in downtown Fennville to provide a retreat to host his out of town "bootlegging" connections as they were en route to making deliveries! 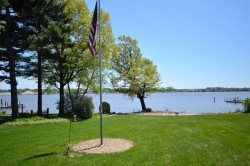 Now, you too can enjoy this quiet historic home and all the amenities it has to offer; Saugatuck, Douglas, Hutchins Lake, and Lake Michigan beaches! Come and spend a long weekend in Fennville; the perfect Romantic getaway or Family getaway. If its just the two of you for a long weekend away you could spend the day shopping in Saugatuck, which is truly a one of a kind shopping experience. Or spend your day touring the vineyards and tasting wine at Fenn Valley Winery. You could end your day enjoying entertainment at the famous Salt of the Earth restaurant. Bring the kids and spend the day at The Children's Museum of Fennville Or hit the Lake and Rent a Canoe at Old Allegan Canoe Rental. Finish the day with dinner at Crane's Pie Pantry. All of these attractions are only a short drive from the house.